Who needs to earn money the slow way? Why not just say, screw our rep, and scam players for all we can. We’ll be fine. These guys are real class acts…. and hopefully you manage to avoid them. This page should give you all you need to know. The company is owned and ran by the Rizzo brothers, Joey and Tommy. BetUS operates out of San Jose, Costa Rica and are a D+ rated book by SBR. Given their history, a D+ sounds generous. What Scams Have They Done? Where do we begin? They’ve had 20 years to pull their scams, and I have only a few minutes to pull the biggest ones and condense them for you to read. Cry me a river, I know. Anyway, here are some of the most publicized scandals. Something that BetUS is known for is not paying players their winnings. This has happened more times than we can count, and even goes back to their casino days. They confiscated funds using a number of excuses, such as suspecting that the player is a pro or apart of a betting syndicate, the player won too much or they didn’t finish their wagering requirements, even though they (probably) did. 1. A player made a bet back in August, 2010. He deposited about $5,000 to his account, increasing his balance to $27,000. Then BetUS took $5,274 from his account, saying that he made several illegal (correlated parlay) wagers, even though BetUS’ software was programmed to accept them. In other words, it wasn’t the player’s fault. He later had his account closed. 2. A player deposited $1,000 to take advantage of a 100% freeplay. The promotion had a 12x rollover and 60 day hold (which becomes important later on). He risked the entire freeplay on a MLB bet with +140 odds. He won and increased his balance to nearly $3,000, which he placed all of on a -150 MLB moneyline. While that bet was pending, he found that he couldn’t access his account anymore. He contacted support and was told that his account was closed due to non-recreational play. His bet cleared, won and brought his balance up to almost $5,000. However, when the player requested a withdrawal he only received $3,516, which didn’t include his freeplay winnings. Because his account was closed he couldn’t finish the 12x rollover, thus prohibiting him from collecting on the offer. 3. In September 2011 a player requested a $1,000 payout and still wasn’t paid as of December 2011. According to SBR that was the 3rd complaint of that type within just a few weeks. These are just a few of the many complaints to come from BetUS victims customers. There was another report of a player settling on a 6-figure balance (that was rightfully theirs) for $40,000. Scam Techniques Used At BetUS? There’s nothing special about the scams pulled off at BetUS. What BetUS is doing is leaning on their terms and conditions, using technicalities like their recreational clause. If you win a lot of money, even if it was a fluke, they’d assume you were a professional, point to their T&Cs and not pay you. And if it was clear as day the money was rightfully yours, they’ll try to make a settlement with you. Most players accept the settlements, too, because in their minds some money is better than no money. And in other cases BetUS just takes their sweet time in paying you. So, all-in-all, BetUS isn’t doing anything tricky. They’re blatantly stealing from you, pure and simple. Knowing this, I would (obviously) recommend staying away from BetUS, or any website or company they might own. Don’t just nod your head either – actually follow this advice. There’s no reason for the Rizzo brothers to continue to get away with this, when there is proof that they’re ripping off players. If you’re not sure where to play, ask your friends. Where do they like to place bets? Who pays them on time? Can other punters vouch for those books, too? If so, that’s where you sign up to, and nowhere else. Yes, surprisingly. In fact, be aware that BetUS may have additional sites used to acquire new customers. 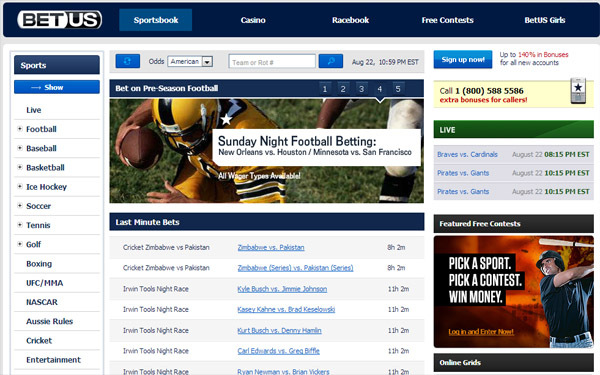 Be sure to read the about page, forums and look up the sportsbooks IP / server details before you sign up. Make sure they’re not associated with BetUS or any of their parent/sister sites. The BetUS site is still open and accepting unsuspecting players. Please avoid these guys. BetUS once owned BestSportsbookReview.com , which was laid out as a review site. Unsurprisingly, they used the site to heavily promote their own brand. The site isn’t live anymore, but I wouldn’t put it past them to have other sites online. Additionally, BetUS is a sister site/company of the Angelcity Group. This company is comprised of many casinos which include, Angelciti Casino, Vacation Casino, Welcome to Our Casino, Netgaming Casino, eMazing Casino, Star-bright-Casino, Casino Paycheck affiliate program, Road Runner Casino, Lucky Dog Casino, Que Pasa Casino. I think it goes without saying that you should avoid these casinos, as well as BetUS, at all costs. Gambling Mogul Gets Married – CalvinAyre article about Joey Rizzo’s recent marriage ceremony. Larry Hartman Arrested – CalvinAyre.com discusses the arrest of Larry Hartman, and the repercussions it may have on the Rizzo brothers. Covers.com discusses the Chase System sportsbetting scam. BetUS at SBR – covers all the reports, complaints and up/downgrades to BetUS’ ratings over the years. SBO BetUS Scam – Details on how they created a shill/copycat site to promote their scam.